There is no right or wrong way to honour and remember your baby. Do what feels comfortable for you and your family and don't allow anyone to make you feel as though what you choose to do is ‘wrong’. The list below will give you some ideas of things you can do to remember your baby and keep his or her memory alive. If you have any ideas that you would like us to add to this list - please let us know. Keep a memory box of your baby’s special items. If you lost your baby due to late miscarriage, stillbirth or neonatal/infant death, you may have clay and ink hand and footprints, hospital bracelets, clothes and photographs of your baby. If you had an early miscarriage or a termination for medical reasons, you may have scan photographs, ink prints or photographs of special places you visited while pregnant which you could store in your Memory Box. You could include letters to your baby, sympathy cards you received when your baby died – anything at all that reminds you of your baby. Buy or make a special box to store all these items in, so you can take them out and look at them whenever you wish. Buy a piece of memorial jewellery with your child’s name and special date on, or with their prints on. If you have ink prints of your baby's hands/feet, you will be able to scan these (please do not ever risk sending the original copies) and send them to specialist companies who can create exact replicas of your baby's prints onto jewellery. Write a blog to record your journey after losing your precious baby. If you are not comfortable with openly sharing your experience with the world, you can make your blog private. You can create a free blog on WordPress or Blogger. Release helium balloons for your baby. You could attach notes or letters to your balloons if you wish. Buy keepsakes and memorial items that remind you of your baby. Name a rose with your baby’s name. Make a donation to a baby loss related charity in your baby’s name. Donations to Aidan’s Elephants are always gratefully received. Order a Molly Bear to fill your arms, a bear that is weighted exactly to match your baby’s birth weight. Molly Bears relies entirely on donations. You do not have to pay to order a bear, but you will need to pay the overseas postage costs when your bear is ready to be posted out to you. Become a SANDS befriender and support other parents who have lost a baby (you can sign up anytime from one year after losing a baby). Contact your local council and find out if there will be any local tree plantings. You could arrange to have a tree planted in your baby’s memory. Plant a flower garden for your baby. You could do this in your own garden if you own one, or you could buy large planters to use on a patio or apartment balcony. Organise a fundraiser or sponsored event to raise money for a baby loss charity, in your baby’s name. If you would like to do some fundraising for Aidan's Elephants, please get in touch with us. Speak about your baby as often as you feel like it, to whoever will listen. Come and join us on Facebook and meet other bereaved parents who will listen with understanding ears. Make a scrapbook or photo album of photographs of your baby, or photographs of things that remind you of your baby – such as sunshine, butterflies, rainbows, etc. Release sky lanterns at dusk for your baby. Light candles for your baby on special dates, or whenever you wish. Attend a creative writing course, a painting course or a photography course and let your baby be your inspiration for capturing the little signs of beauty in the world. Organise something special on your baby’s birthday or a special date. You could ask friends and family to join you in releasing balloons or sky lanterns, or you could do something small at home by yourself to remember your baby, such as writing a letter, lighting candles on a cupcake, or buying a special keepsake that reminds you of them. Take photographs of items that have your baby’s name on, or you could take photographs of your baby’s name written in the sand, on pavements, made out of pebbles, leaves – anything at all. 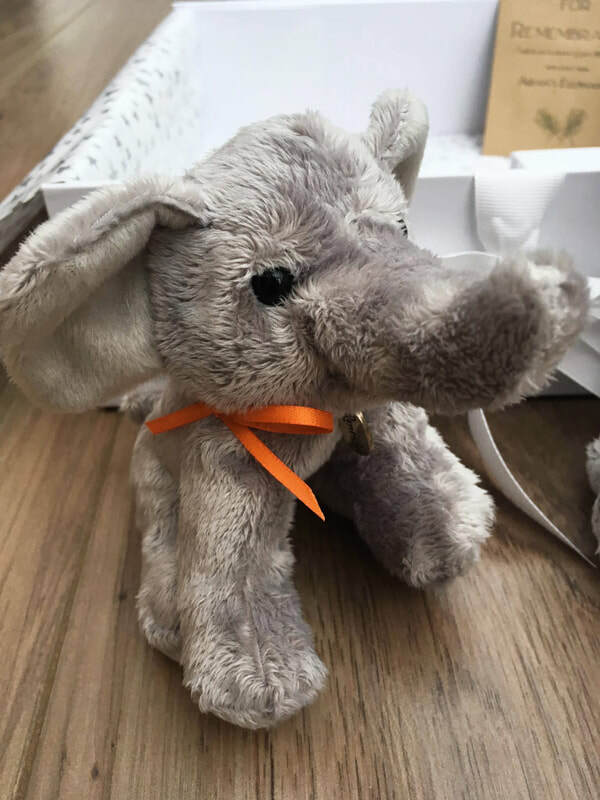 Get involved with Aidan’s Elephants and help us to support other bereaved parents, in honour of your baby. Send us an email to find out how you could help to make a difference.